It is not always readily apparent why a car accident occurred, but most are attributed to driver error. However, accidents can also be caused by poorly maintained vehicles. It is important to be aware of common mechanical issues and correct any issues that you find. Properly maintaining your car will help avoid accidents caused by mechanical failures, and if you are in an accident, you may be able to prove that you are not at fault and receive compensation for your injuries. 1. Tires and wheels. 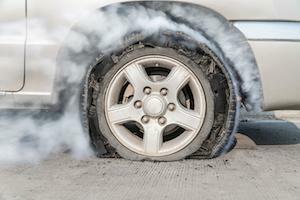 According to the National Highway Traffic Safety Administration (NHTSA), tire problems account for 35 percent of accidents where a vehicle failure was the cause of the crash. Tire problems can include blowouts (which are especially common in 18-wheeler accidents) or worn tire treads that impede a driver from maintaining proper control. 2. Brakes. Brake issues comprise 22 percent of accidents where vehicle failure was the cited cause of the wreck. Brake issues include faulty or worn brake lines, Anti-Lock Brake System (ABS) malfunctions and worn brake pads that should have been replaced. 3. Steering and suspension. While these issues can be harder to document post-crash, in some cases it is obvious that steering and suspension malfunctions led to the loss of control of the car that caused the accident. 4. Headlights, taillights, and brake lights. These types of failures often come into play in low visibility situations, such as fog, rain, or darkness. While fault is typically attributed to the back car in a rear end collision, missing taillights or brake lights can mean that the front car is liable for this type of accident. If you have been in a car accident, call the accomplished Plainfield, IL motor vehicle crash attorney of Flaherty Law today at 815-577-7500 to learn the best approach to take in your case. Our firm typically accepts car accident cases on a contingency fee basis. Under this arrangement, we do not charge the accident victim for attorney’s fees upfront, and we do not get paid unless you recover for your injuries. Our firm also offers free initial consultations. We want to give accident victims every chance possible to receive compensation for their injuries. Compensation you may be eligible for includes: medical bills, pain and suffering, loss of enjoyment of life, lost wages, and lost future employment opportunity. We find that accident victims often undervalue their injuries. It is critical that you speak to an attorney before settling with an insurance company, especially if you have substantial medical bills. Call our office to set up an appointment with our firm today. How are Diabetes and Car Accidents Related?